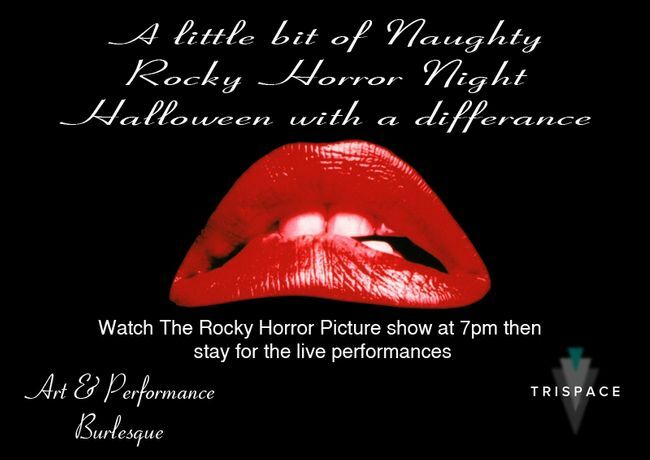 TriSpace Gallery is hosting the next instalment of our series of Burlesque and Sensual Arts, cabaret evenings to stimulate you senses. We are an event space Supporting an art gallery showing what is new upcoming and affordable art, situated 5 minutes from Bermondsey station. We are the perfect place to entertain and stimulat your senses as a strong supporter of arts in London. Join us on HALLOWEEN for the screening of the original Rocky horror picture show movie at 7 pm followed by a selection of Art, Cabaret, Performance Burlesque after. Place: Old Biscuit Factory, (Drummond Rd entrance) buzz to come in hehe Our fully stoked bar supporting a number of resonably priced cocktail and locally micro brewery beers for the connoisseur. If you're looking for an evening filled with excitement and energy come along! Two of the performers are: Verity Danbold and Molly Pharo More performers TBA!